We were slowly making our way back home on our May trip to Scotland. Ten days earlier, Chris and I (plus Border Collie ‘Mist’ of course!) 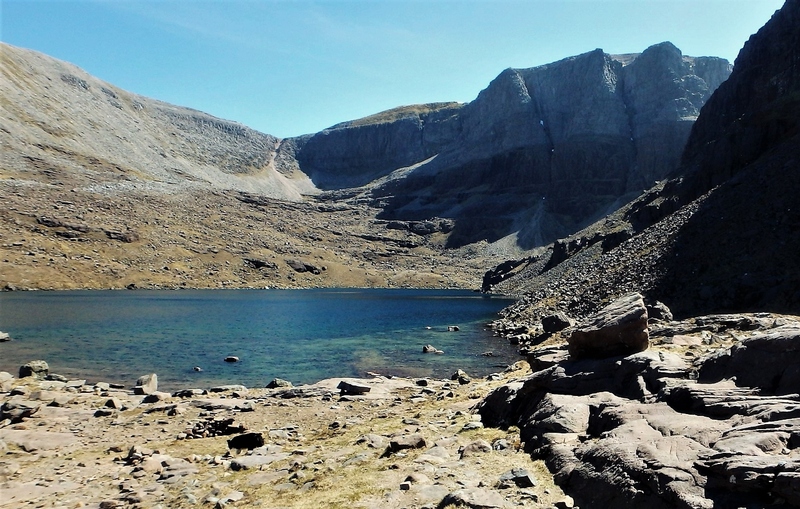 had a great walk out to Coire Mhic Fhearchair near Torridon – the corrie is one of the most impressive in the Scotland, and the background story of the Beinn Eighe aircrash brought extra interest. 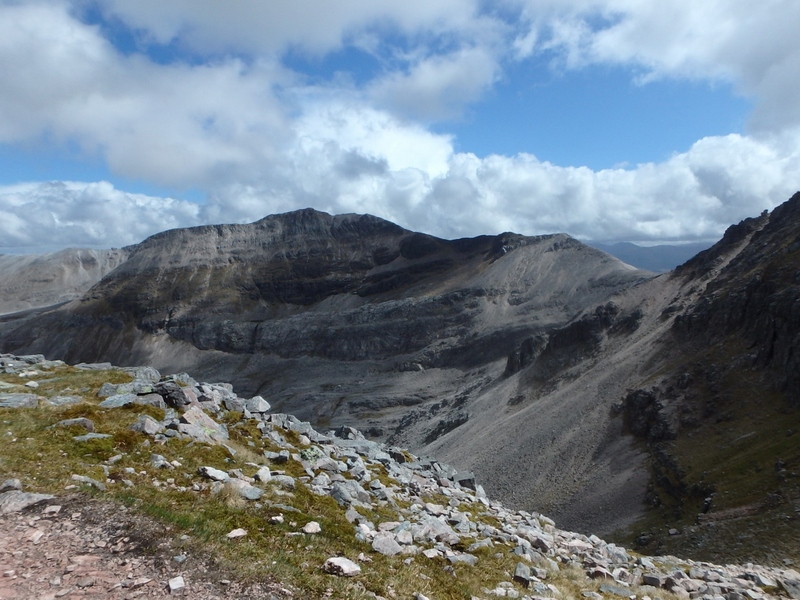 I still fancied a day out on the Beinn Eighe Ridge, so a return visit as we headed south seemed a good idea. 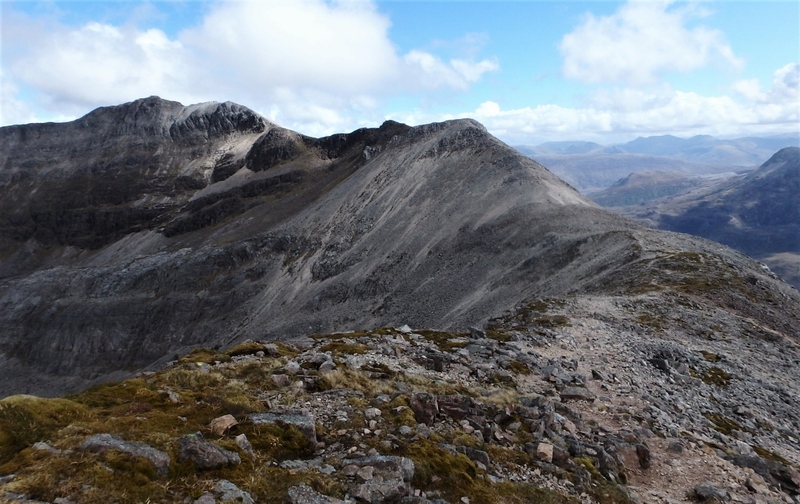 When we visit a new area I usually do some internet research to get the bigger picture, but a second trip out to Beinn Eighe was a last minute, ‘off the cuff’ outing. 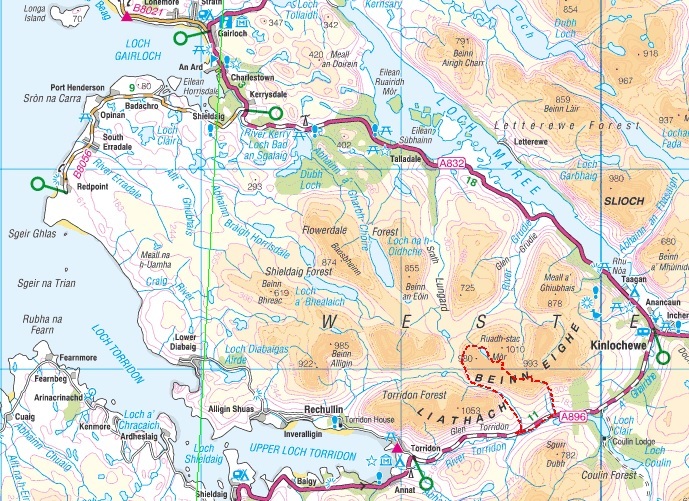 So, it was back to the old traditional method of using the map to plan the day. 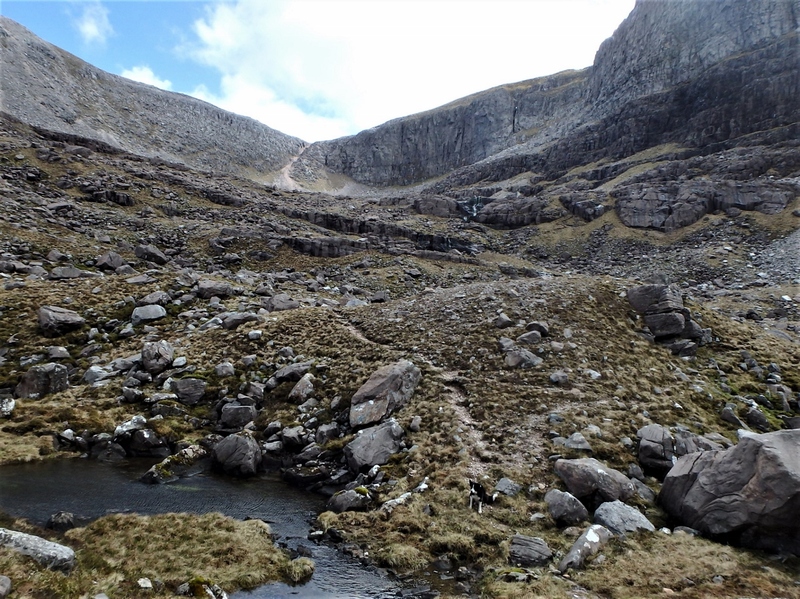 I had already walked the path out to Coire Mhic Fhearchair and there was an obvious descent path from Spidean Coire nan Clach in the centre of the Beinn Eighe mass – all I had to do was to find a breach in the defences of Beinn Eighe. 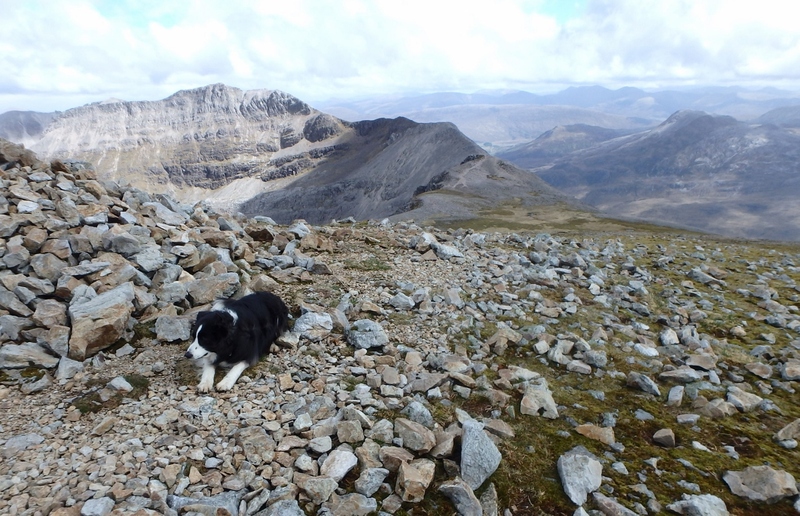 I set off with the dog in gloomy weather conditions, though the forecast promised an improvement, and ‘Mist’ and I made good time round to Coire Mhic Fhearchair. 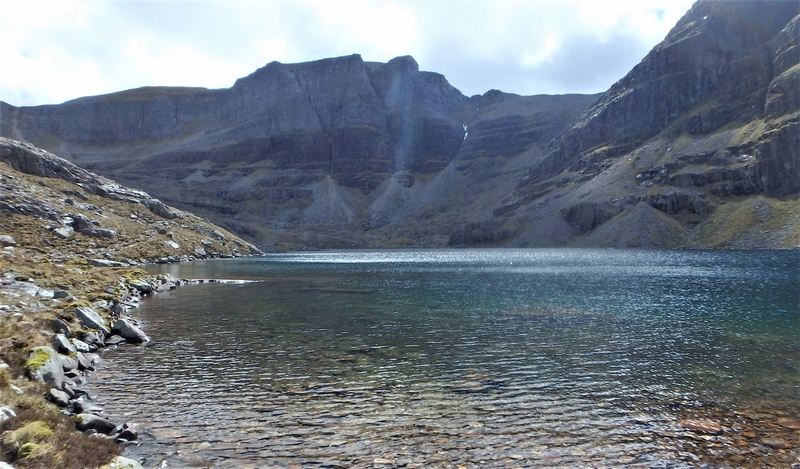 Sure enough, the cloud started to lift but a sharp breeze in the corrie suggested that it might be a good move to grab a bite to eat before heading on to high ground. 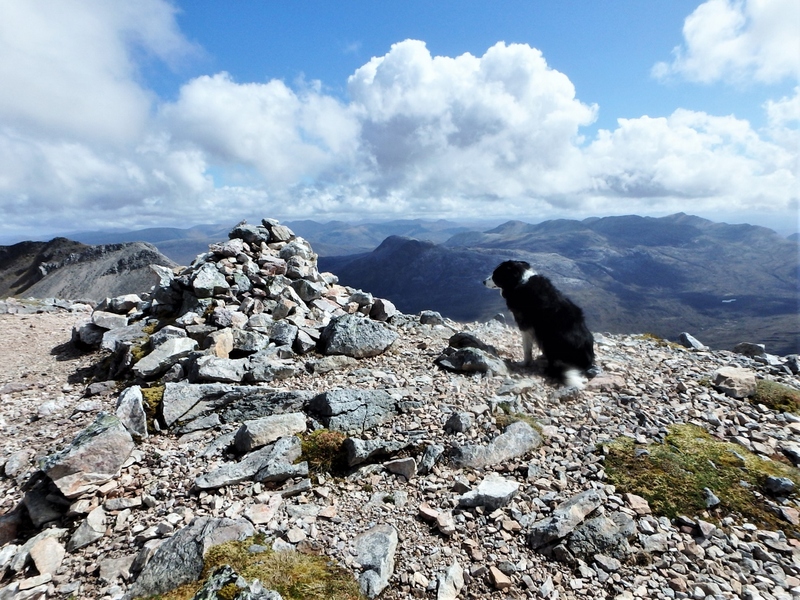 The dog agreed – when it comes to food, ‘Mist’ is more Labrador than Collie! 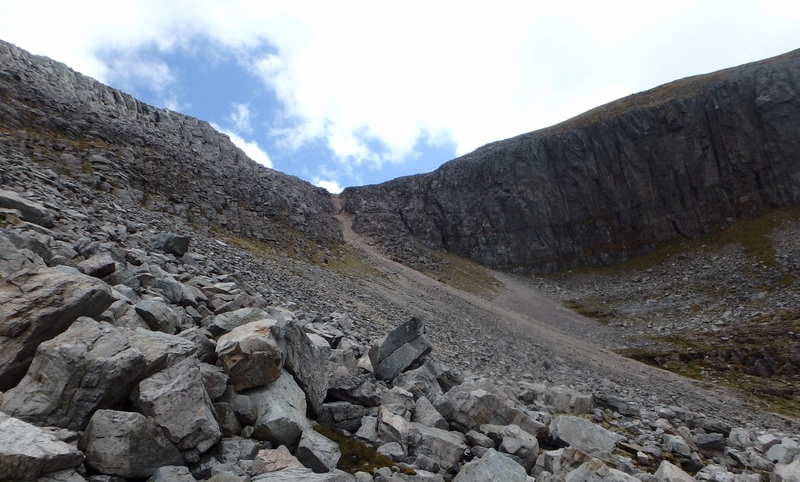 The next move was to head for a scree chute at the southeast end of the corrie – on the previous visit it looked as though it would give access to the Beinn Eighe Ridge above. 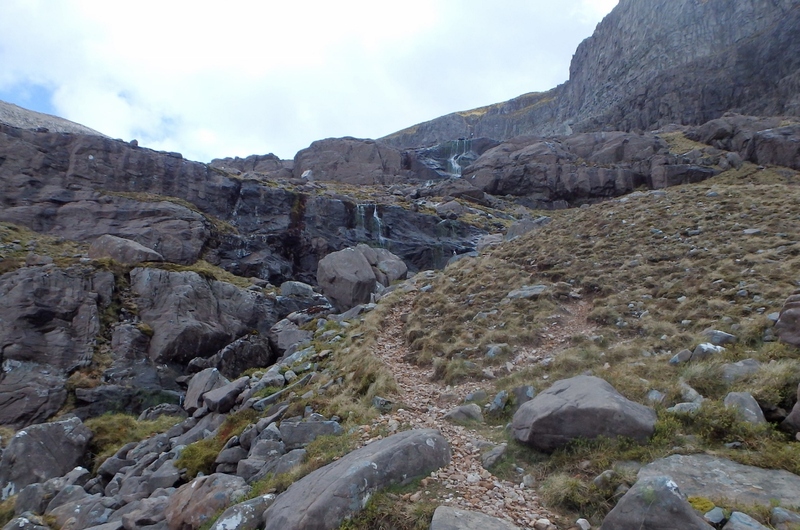 The path threading its way towards the scree chute …. 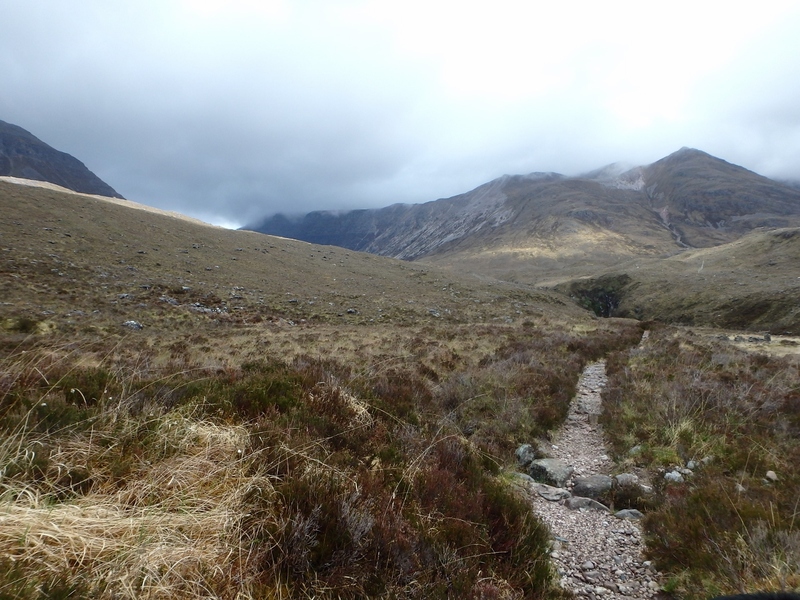 A narrow path skirted the east side of the loch before rising towards the scree chute through a series of small crags and waterfalls. 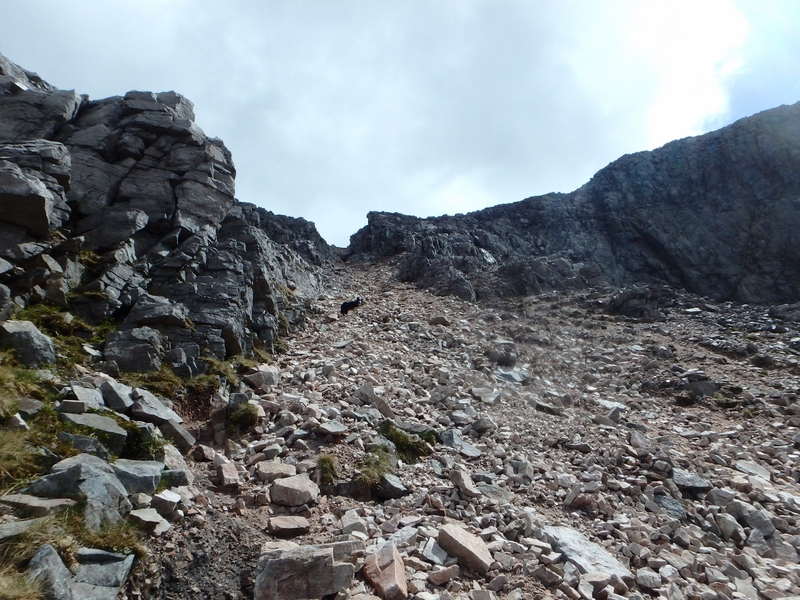 I noticed a figure much higher than me, heading towards the same gap – he didn’t go straight up the scree chute, but instead headed up through boulders to enter the chute high up on the left. 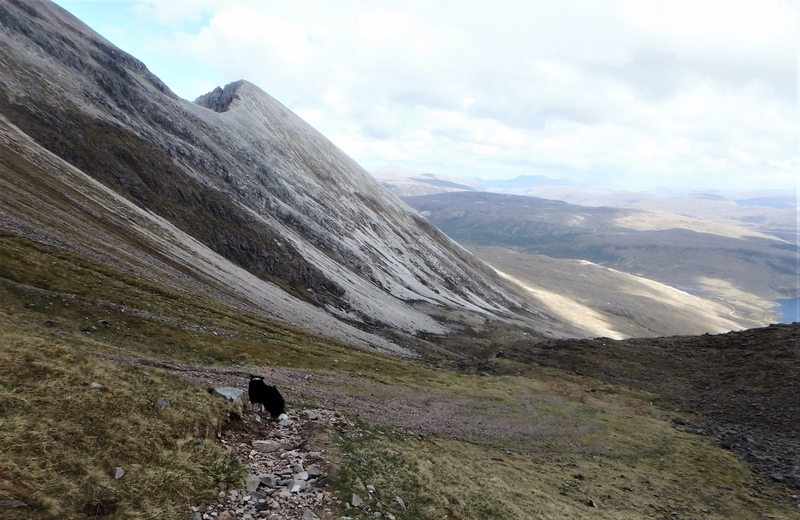 His progress was good, so I headed the same way – the left edge of the chute followed a better line than the loose scree, and the dog and I were soon on the col between Coinneach Mhor and Ruadh Stac Mor. 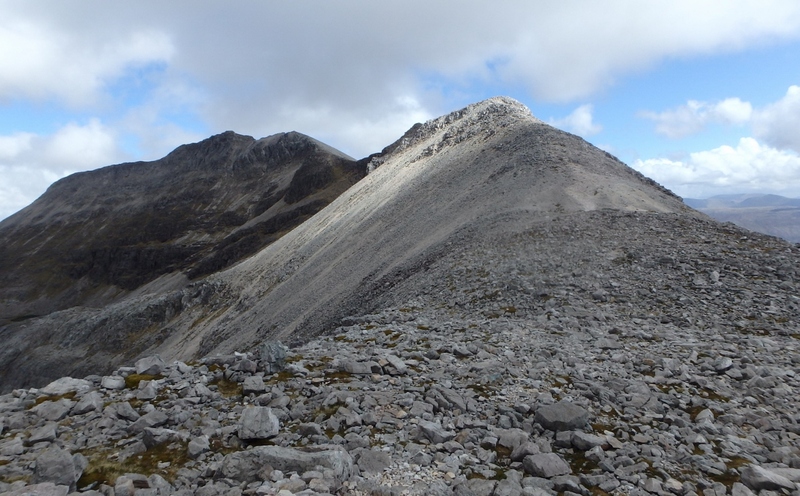 My original plan had been to include Ruadh Stac Mor (1010 metres/3314 ft), the highest summit on the Beinn Eighe mass, before heading back to Coinneach Mhor and the Beinn Eighe Ridge. As I reached the col, the plan remained intact for about five seconds – I emerged into a wind that would strip paint off a fence! It wasn’t particularly strong, but felt as though it had come straight out of Murmansk. 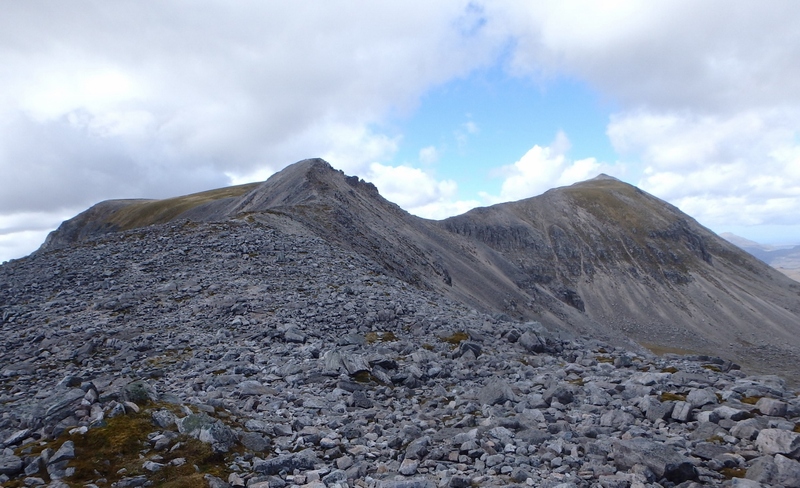 I made a quick decision to head straight up to Coinneach Mhor, then on to Spidean Coire nan Clach. 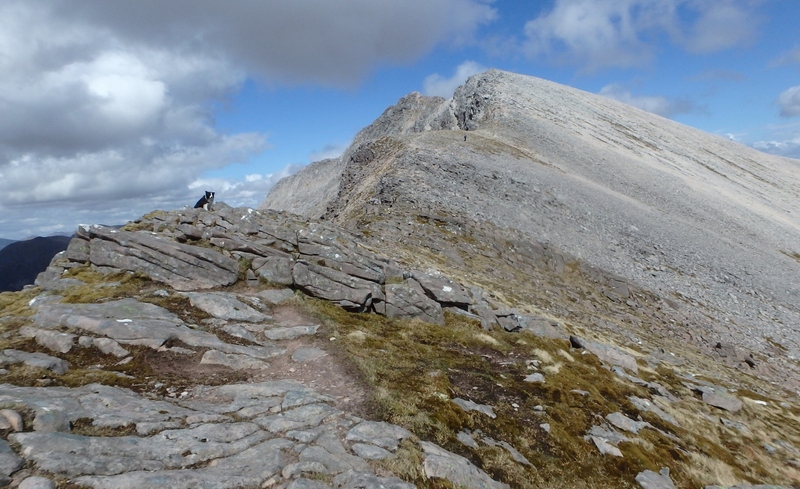 The descent to the col on the Beinn Eighe Ridge …. 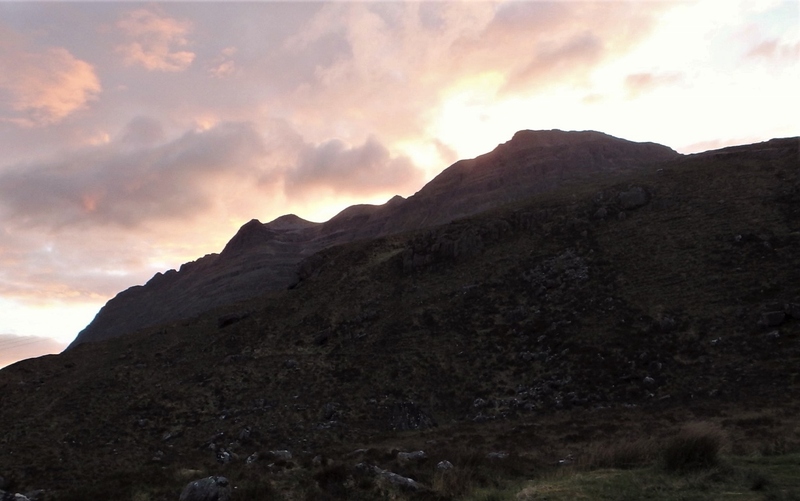 One last look back to Coinneach Mhor (left) and Ruadh Stac Mor (right) …. …. then the very last bit of uphill, still chasing that ‘shadow’! 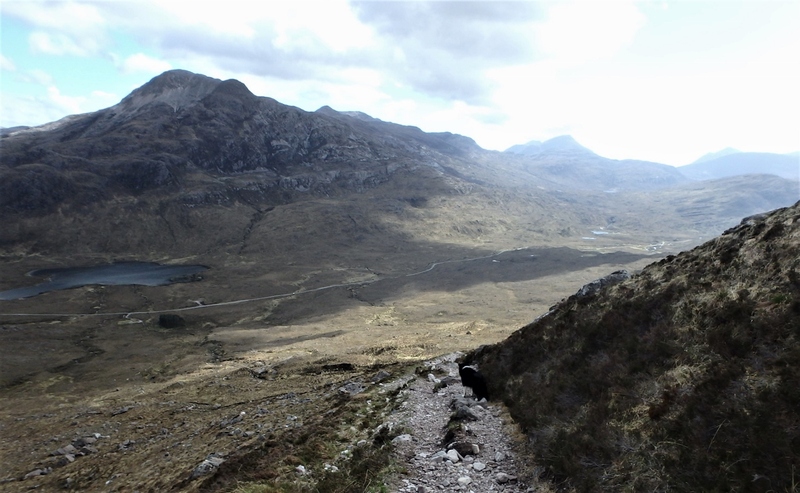 Heading towards Spidean from Coinneach Mhor, I looked back to check progress and saw a figure steadily gaining on me. 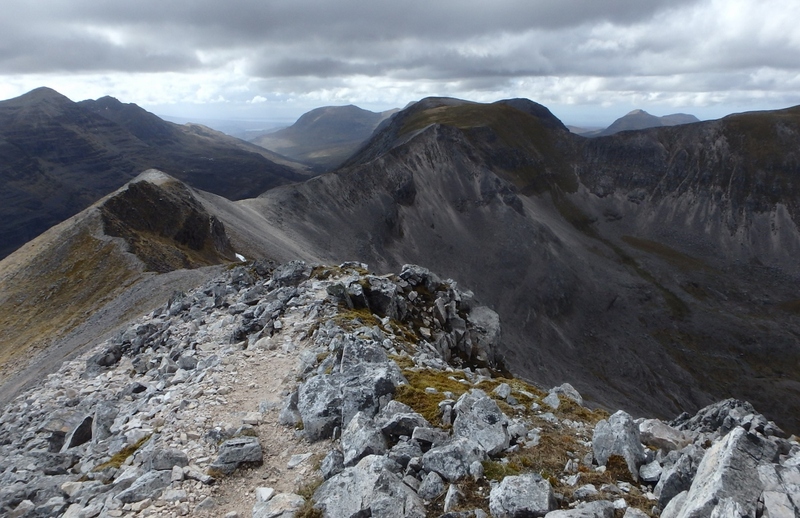 My ‘shadow’ was the person who had ‘showed me’ the easy way to take the scree chute, and he had obviously included the outlying Ruadh Stac Mor into his day. 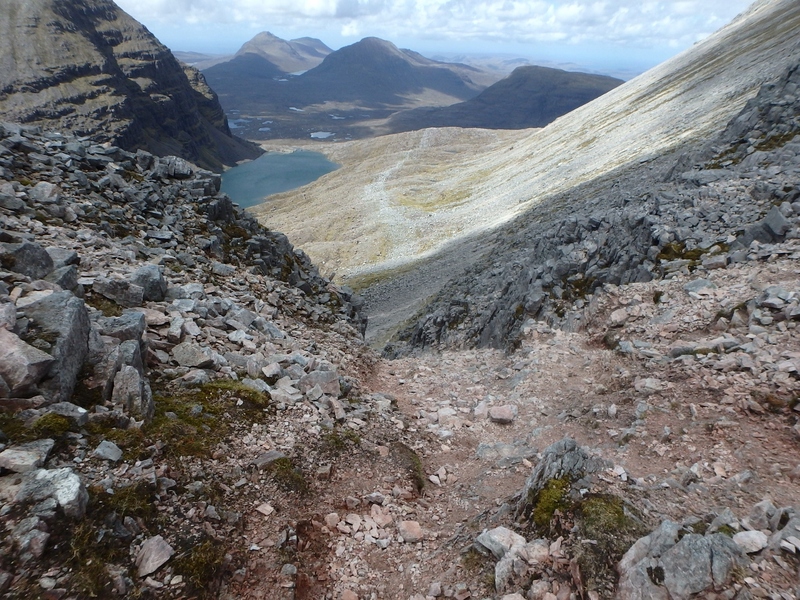 He caught up with me on the col on the lowest point of the ridge – he was about half my age and obviously very fit. The cold wind meant that we didn’t linger over a conversation, so after a few words he was off, with me trailing behind. 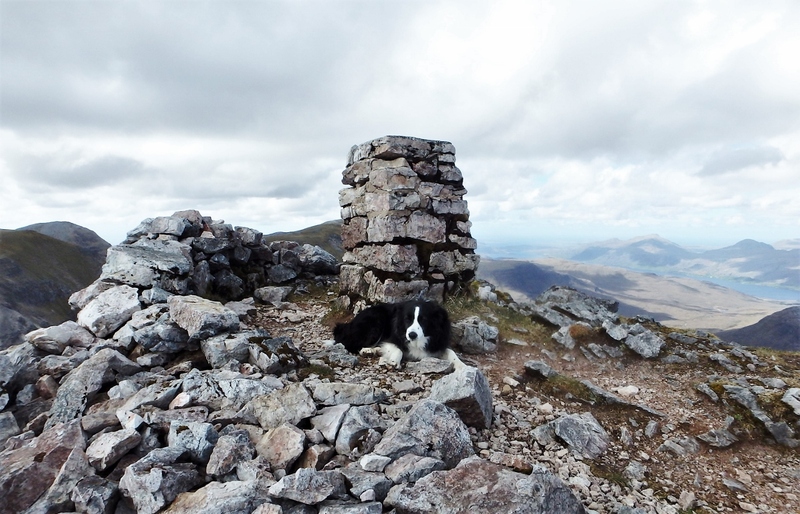 ‘Mist’ at the Trig Point on Spidean …. …. 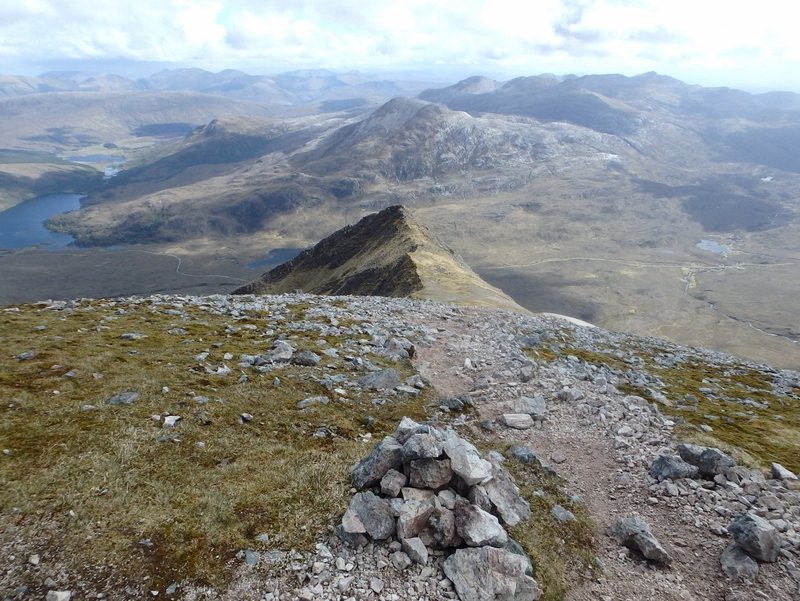 before the start of a lot of descent, first south down the ridge from the Trig Point …. …. 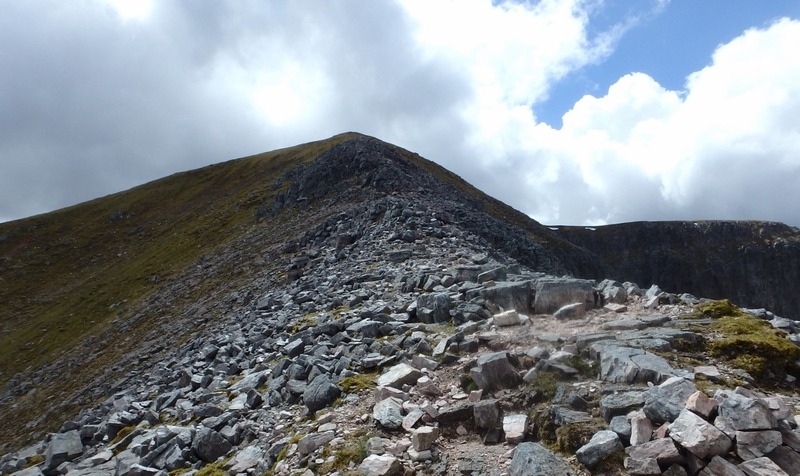 turn left at the cairn …. 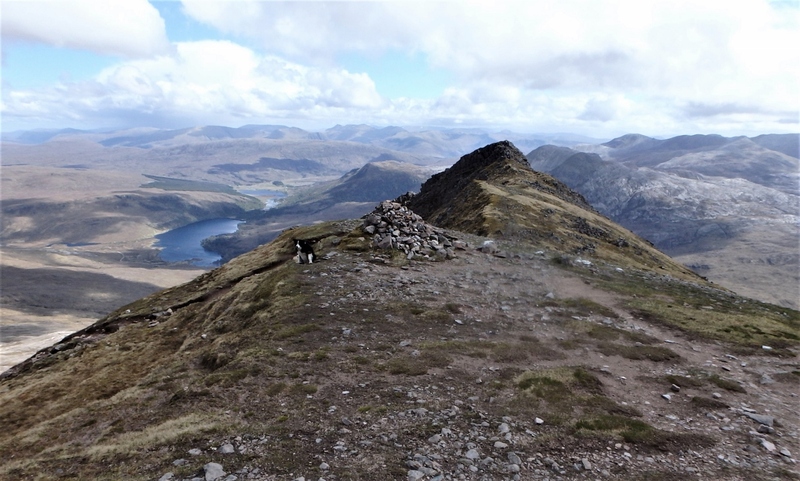 I wasn’t as fast as my ‘shadow’, but the cold wind ensured that I wasn’t hanging around, and I was soon at the Trig Point on Spidean. 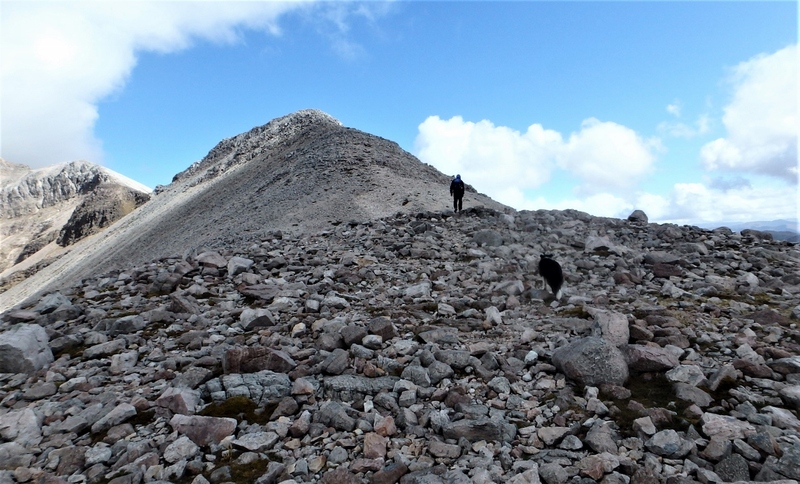 The true summit was only just over 100 metres away, so after a brief visit to the top it was time to head down. A well-defined ridge heading south pointed out the way down, and even better it acted as a wind break. The rest of the outing was pleasantly warm. 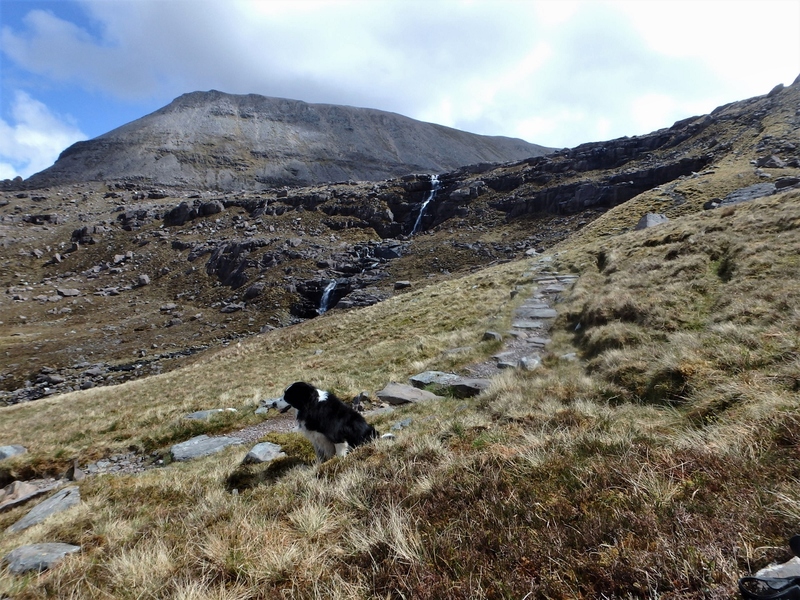 After a long descent down Coire an Laoigh, the dog and I reached the road for a steady walk back to the van – dinner for the ever-hungry Collie and a cold cider from the fridge for me. 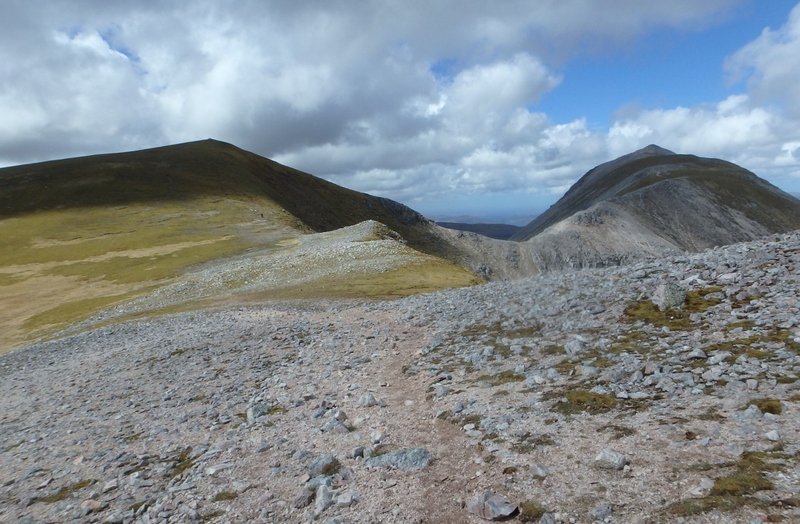 Those who don’t go up mountains for fun may well wonder what enjoyment there is in making a hasty crossing of a ridge, chased by a wind that would turn your eyeballs inside out. In truth, it was probably one of the best mountain days I’ve had this year, and going through the photos for this post brought back the memories. 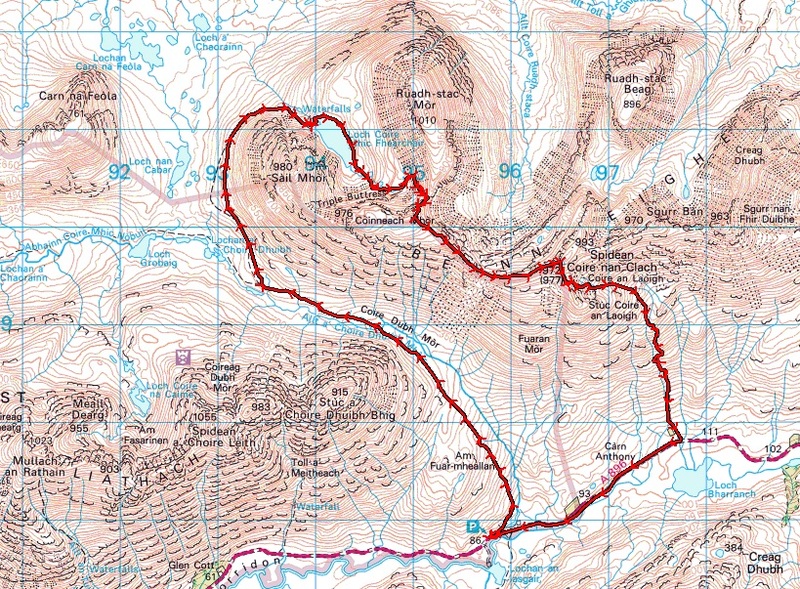 I’ll go back there, and I’ll collect the bits I missed out, including the ‘Bad Step’ that I didn’t know about, and which I read up afterwards in a post by fellow blogger, ‘Mountain Coward‘. If I’m honest, I wish I was up there right now. This entry was posted in 1. 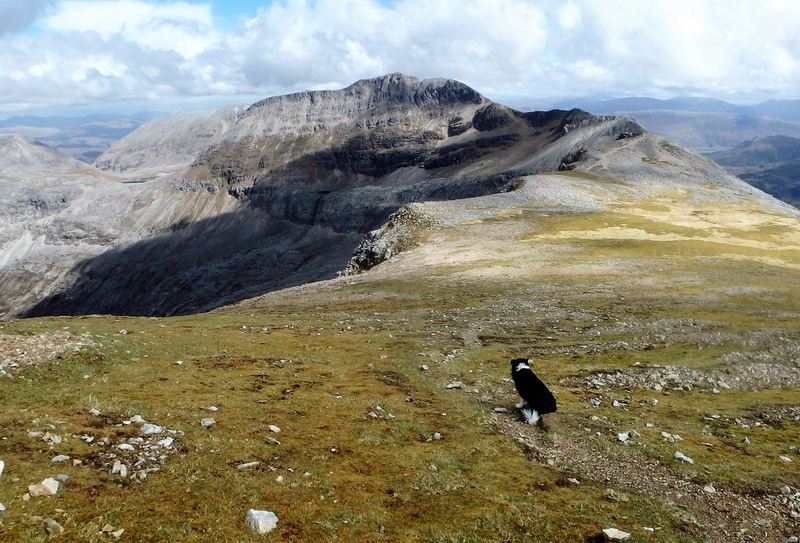 Scotland and tagged Border Collie, hillwalking, mountaineering, mountains, photography, Scottish Highlands. Bookmark the permalink. Really enjoyed joining you through these pictures on your adventure. Having ‘Mist’ in the pictures made them even more wonderful! What a great companion. Mist is the best of companions in the mountains – never complains, never asks for the map, never asks how much further we have to go. She’s nine now and still wants to play at the end of a hike! Looks like a beautiful day out, Paul. It certainly was Andy – great light and good visibility. 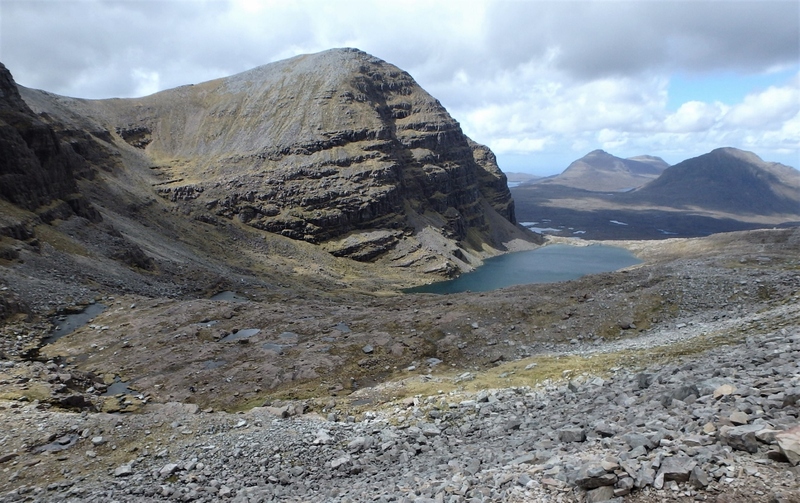 May is often the best time to visit the Scottish Highlands. 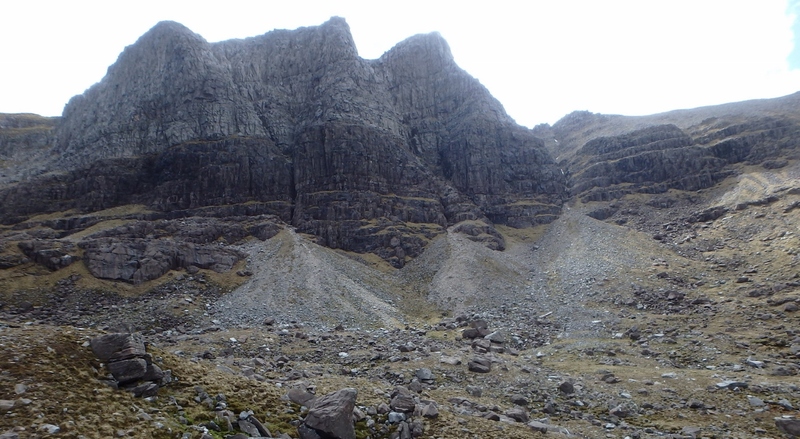 Coire nan Laoigh is horribly eroded now isn’t it? That was the one where Richard fell and ended up going down the corrie on the screen head first on his back – I was in hysterics! I quite fancy the ridge from the little peak on the end sometime – I’m sure it would be far nicer than the corrie screes! Good idea for the alternative descent Carol – I might give that a try the next time I’m there. 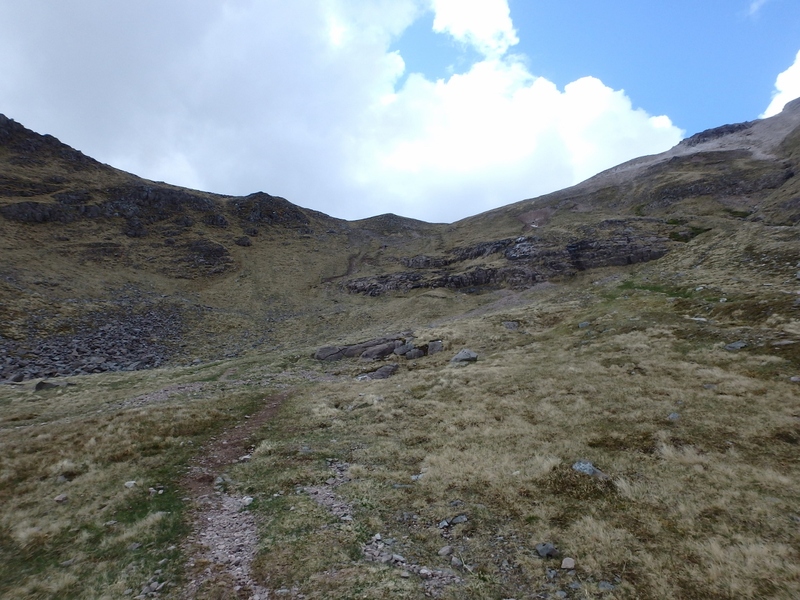 or you could try sliding down the normal route head first on your back- it did look great fun… NOT!